This impressive business centre consists of first-class offices of various size which can be tailored according to your needs. Available at flexible rental terms, the offices are provided with spacious meeting rooms, state-of-the-art technology, parking facilities and benefit from cleaning and secretarial services, to offer a highly professional and efficient working environment. The business centre is close to the motorway network and enjoys excellent connections to the airport. 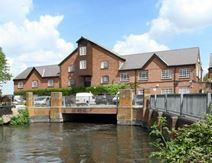 Centrally located for both Thames Valley and Greater London road access and minutes from Heathrow Airport - an unrivalled position overlooking the River Colne - this office development offers 1,642 sq. ft. space available on a full repairing and insuring lease with eight on-site parking spaces and a workspace full of natural light. 24-hour access is available, and the on-site management team can help with your every need.